I haven’t posted in a long time. During the communication gap, my dedication to the keto eating plan has been sorely lacking. I have also felt lethargic, gained back all the weight I lost on the plan, and am probably in the worst shape of my life. I started this blog a long time ago with great hope that the ketogenic diet was finally the answer to my weight loss problems. I still believe that notion was correct. I am the only person who can make the decision to pick myself up, dust myself off, and start once again. The keto plan was the last great hope after trying and failing on several other diets. I am throwing myself back into the plan wholeheartedly. The food was delicious, reducing carbs gave me energy, and I saw a significant weight loss in a short amount of time. I have the knowledge, the recipes, and the ingredients. All I need is the will to begin again. was 2 eggs over easy with bacon. I had not made up my mind about going back on keto this morning, so I had one piece of whole wheat toast and 1/4 cup of hash browns. Then came the decision to break out the recipes and get back to it. Tacos: 2 pieces of provolone cheese, nuked and curved into taco shell shapes. 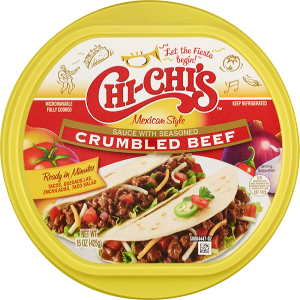 I used Chichi’s taco flavored meat (about 4 tablespoons) and topped with 1/4 cup of grated cheddar cheese, 2 tablespoons of sour cream, and some chopped jalapenos. 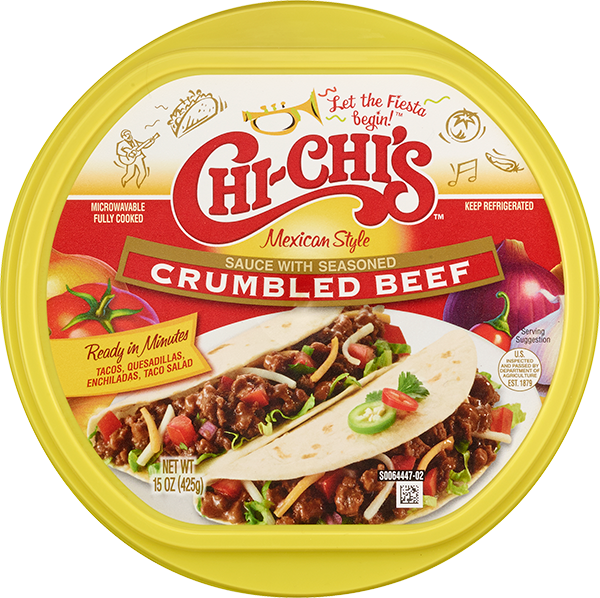 The Chi-chi’s is 3 grams of carbs per 4 tablespoon serving. The entire process took fewer than 5 minutes and the tacos were as good as any fast food joint’s carb-laden version. The Chichi’s meat is definitely an expensive cheat. I could easily make myself the same mixture with some ground beef, but I think time and convenience will be of the essence as I reintegrate the keto plan. Rick grilled steaks and Portobello mushrooms. I made a salad with grated cheddar and blue cheese dressing. VOILA! Drank lots of water until bedtime. Day one was a breeze.